Prodim Bent Glass software is built in a way that we can provide a tailored package fitting a glass manufacturer’s needs. Contact Prodim for advice. The Model module helps glass manufacturers to create a 3D glass surface from Proliner measurement data or existing drawings. 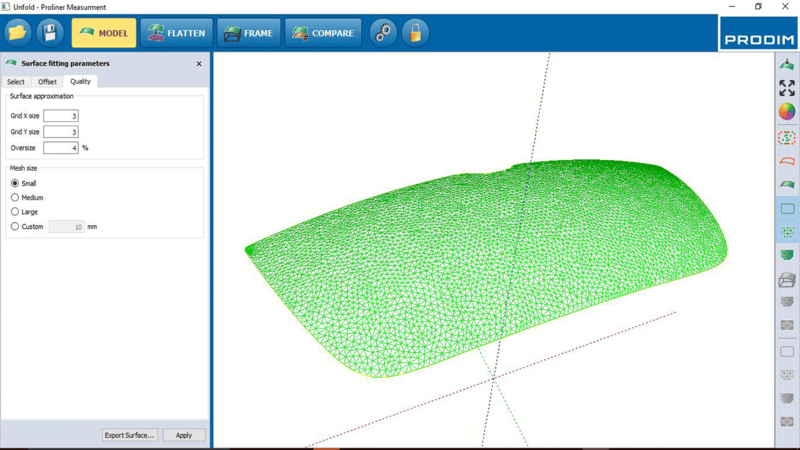 Complex operations like sampling data, interpolating edges, fitting the surface and mesh creation become very simple. Extends the Model Bent Glass Solution with the extra Flatten module. The Flatten module enables glass manufacturers to transform a 3D surface to an unfolded 2D surface with only one mouse-click. Mechanical stresses based on FEM-analysis are calculated in the same process and the result is clearly visualized in multiple views. The 2D surface can then be exported as a simplified 2D contour shape to prepare it for production. Adds the Frame module to the Model – Flatten Bent Glass solution. The Frame module enables glass manufacturers to generate a digital support frame based on a 3D glass surface model. The support frame can be edited to meet with the manufacturer’s production standards. The digital frame can be exported as a complete 3D drawing as well as in simplified 2D sections. PDF reports with relevant construction data can also be exported. 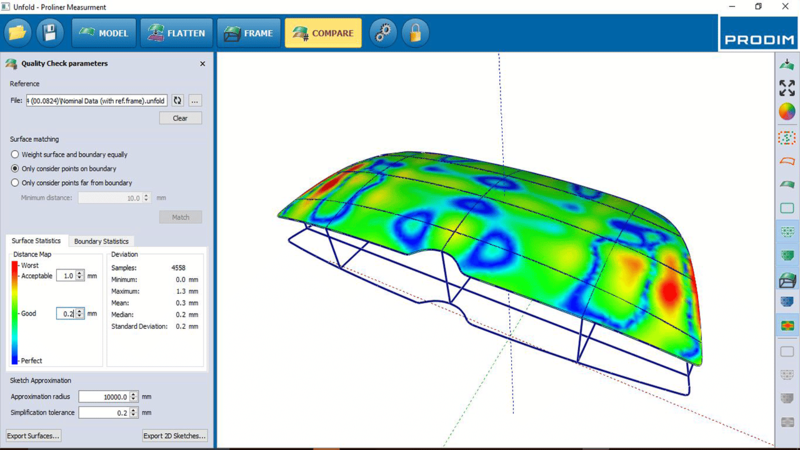 Completes the Bent Glass solution by adding the Compare module. 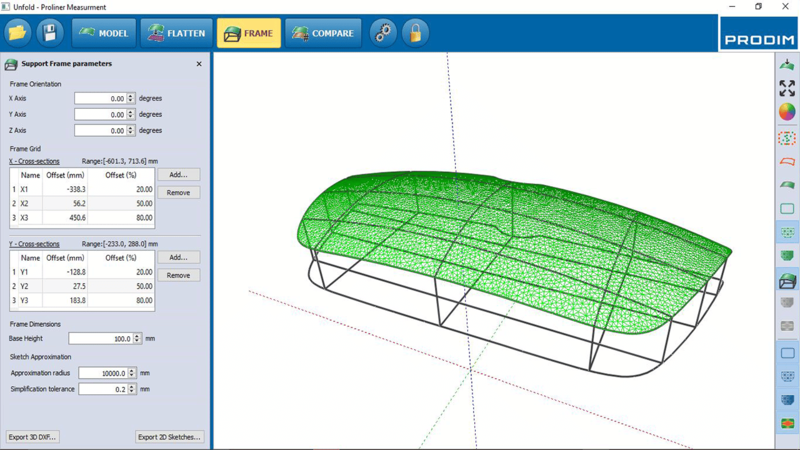 With the help of the Compare module, glass manufacturers can easily match two 3D surface models using various aligning methods. 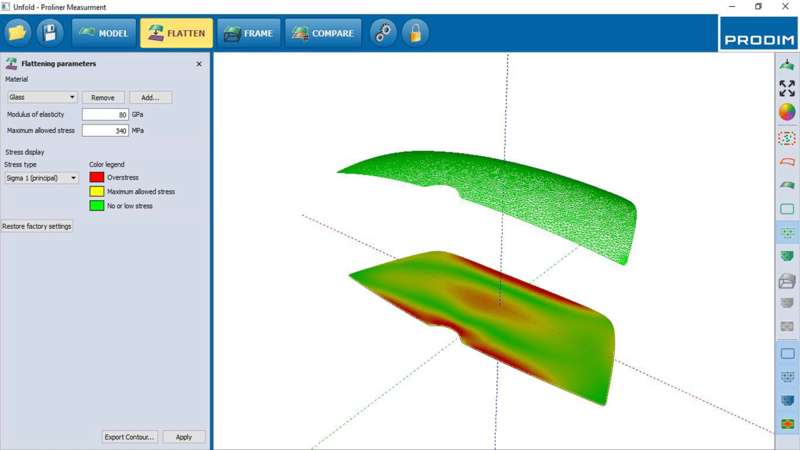 Nominal data and quality parameters can be defined and compared for both, surfaces and boundaries. The results and possible deviations are clearly visualized in 3D and can be exported as simplified 2D section views to also compare the results in 2D. Detailed PDF quality reports can be generated as well. 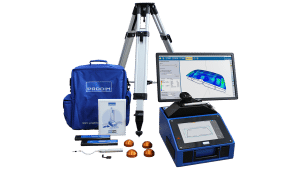 Prodim offers a complete package for measuring bent glass. The package contains a Proliner of the Industry Series: world’s most flexible and efficient 3D Tracker for measuring 3D glass shapes.